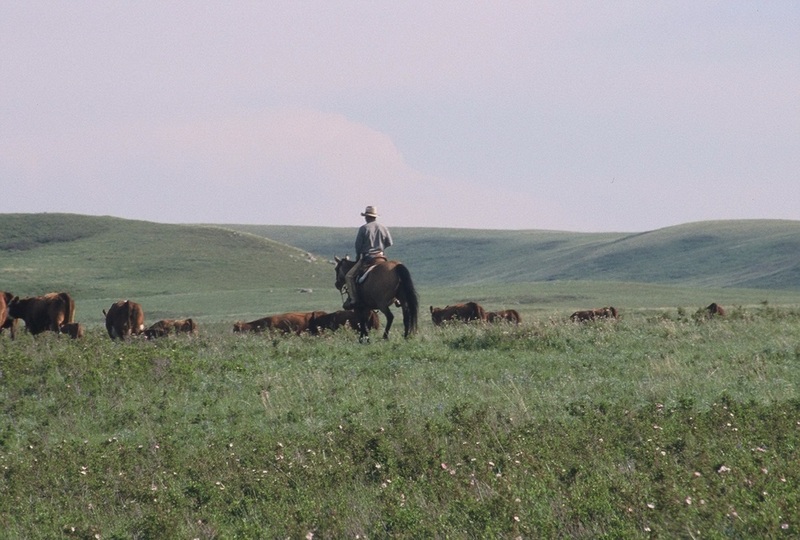 Grasslands National Park following a recent burn (green area at right is where the burn occurred) (photo, H. Hinam). 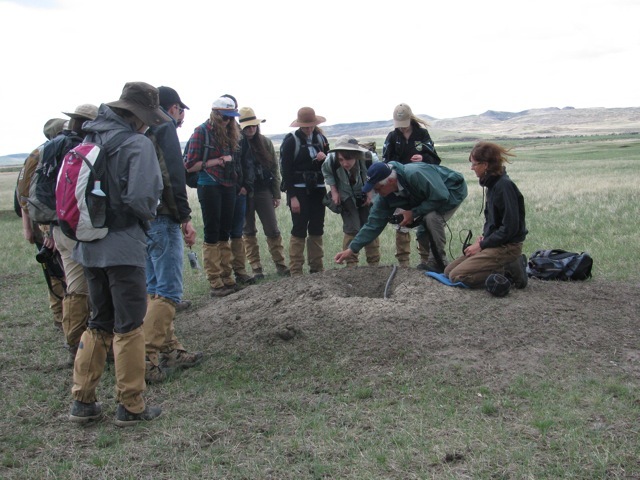 Students conduct a project on waterfowl at one of many prairie potholes at the McIntyre Ranch (photo, H. Hinam). 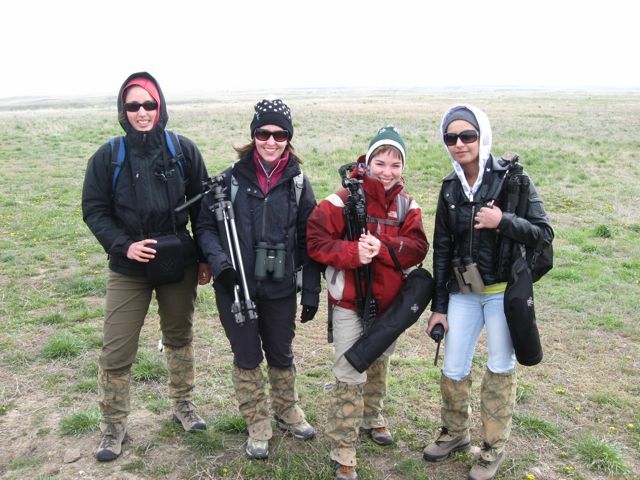 Day 1 2011 course: Students sporting the latest in snake gaiters, binos and spotting scopes before our trek to the "snake pit" prairie dog colony and hibernaculum. 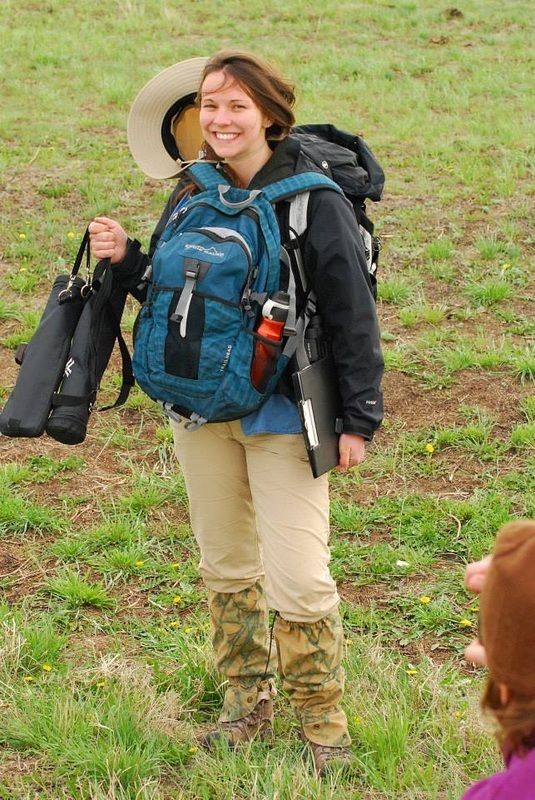 Fashionista field course student Kate Dyke models her snake gaiters, Eagle Optics spotting scopes, and front and rear backpacks (photo, H. Hinam). 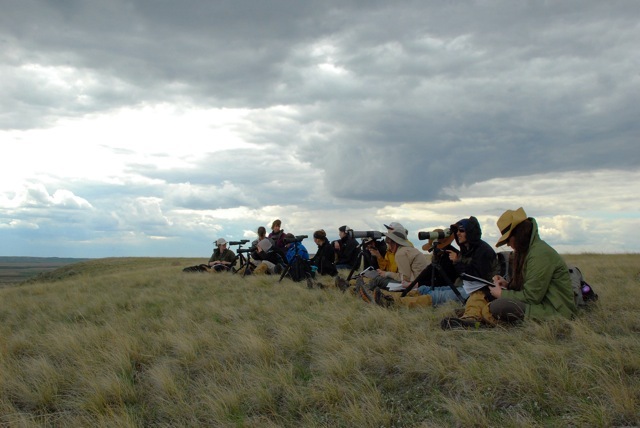 Students take their first stab at spotting, viewing prairie dogs on a colony at the base of the hill (photo, H. Hinam). 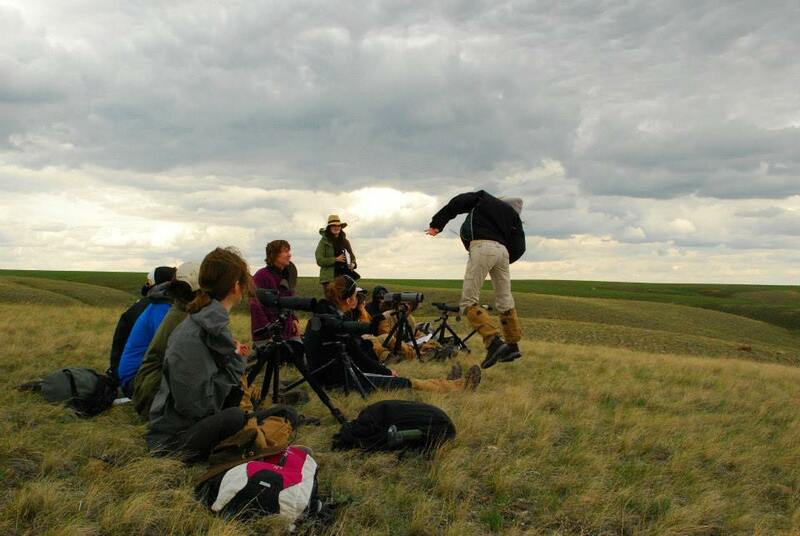 Alyssa demonstrates the "Jump-Yip" as the class develops an ethogram of prairie dog behaviour (photo, H. Hinam). 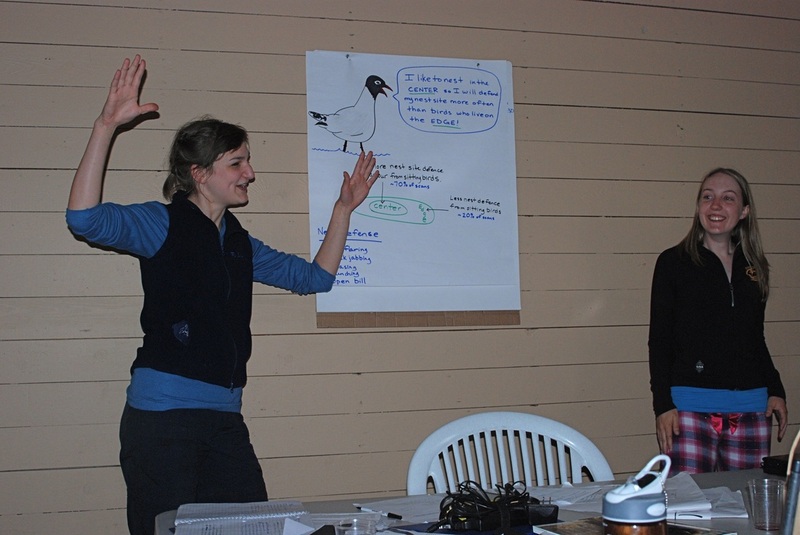 Most evenings at the kitchen hut at The Crossing, we had a guest presentation. 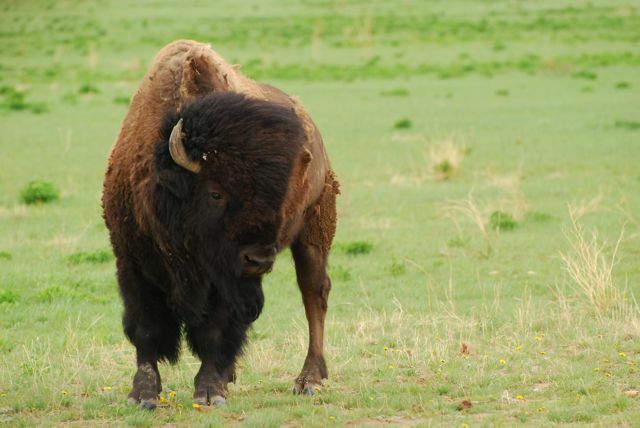 Here, Wes "Bison" Olson tells us about the relationships between bison, prairie dogs and other inhabitants (including plants!) 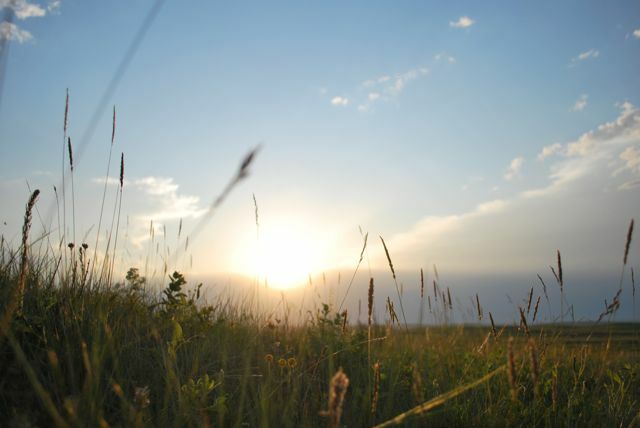 of the grassland ecosystem. 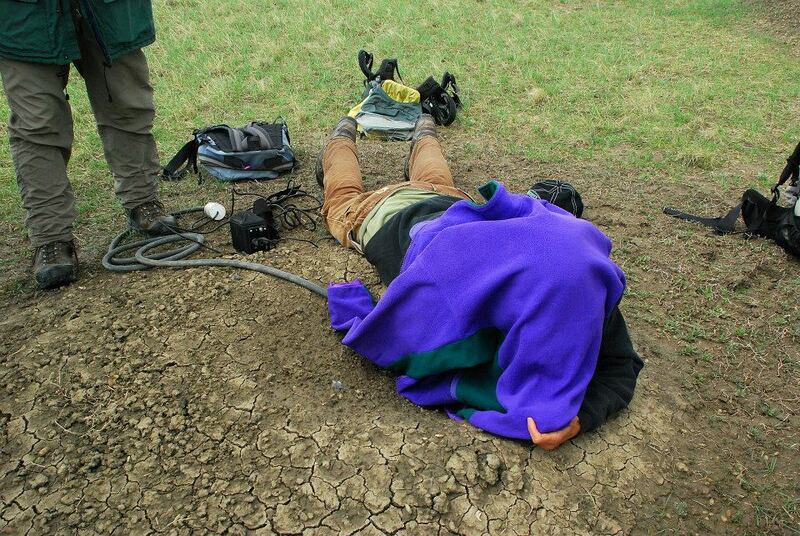 This was followed by a field expedition the next day (below). 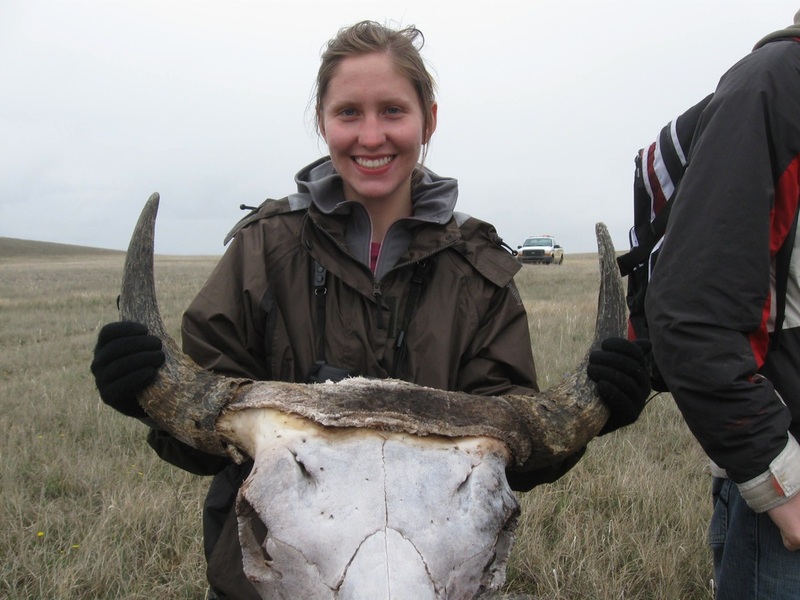 Can't learn enough about bison! 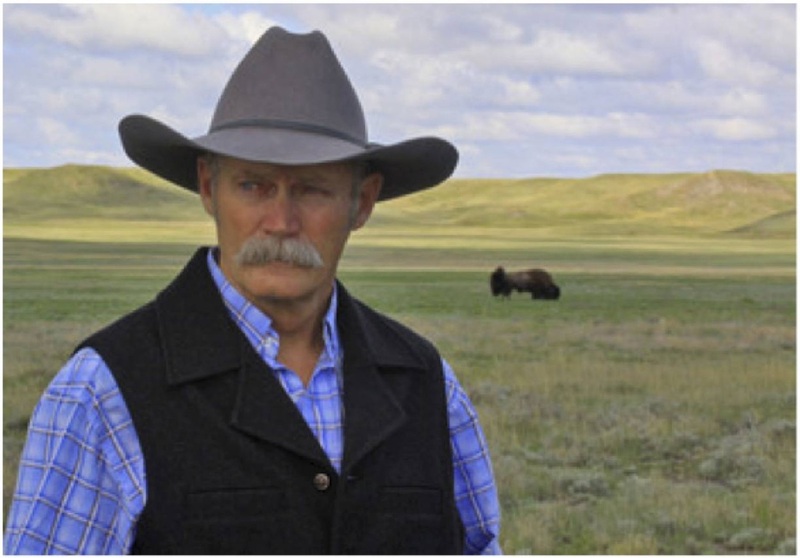 Wes showed us a few tipi rings at Grasslands National Park, explaining the cultural history and design (H. Hinam, photo). 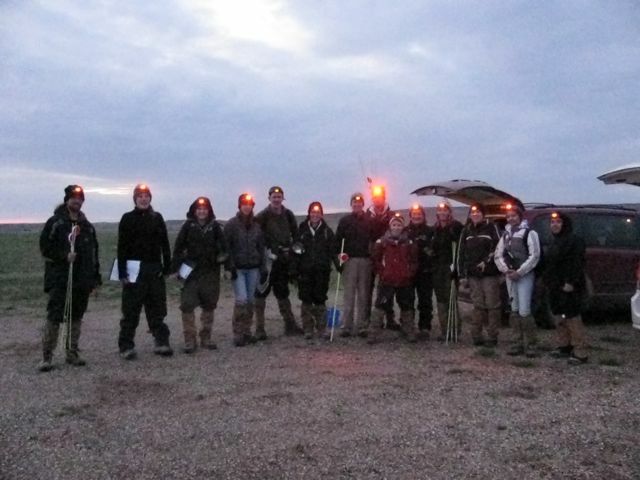 All ready and extremely excited to begin an overnight ferret spotting expedition!! 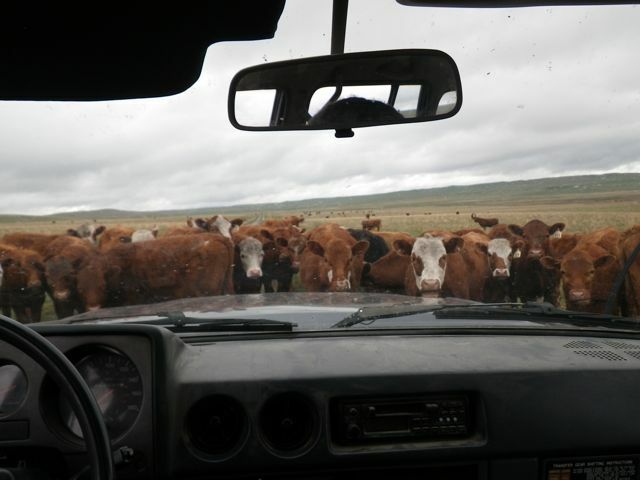 Half the class sits at a sheltered location. 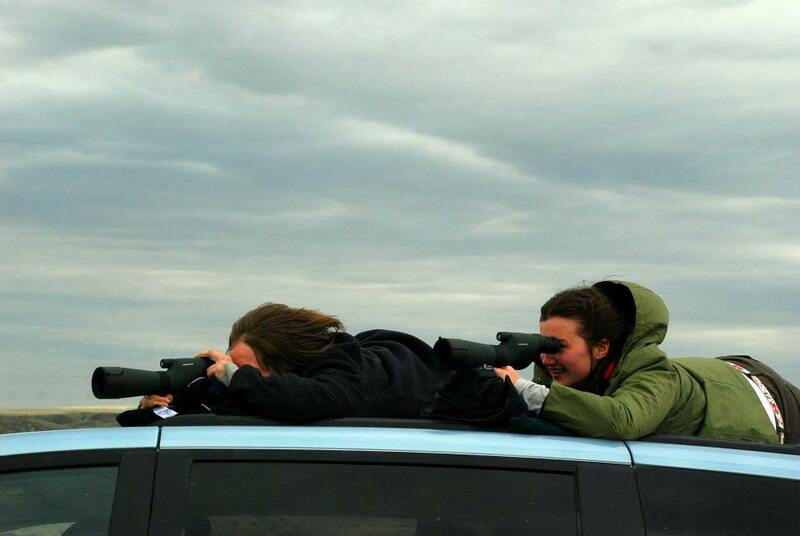 The other half "makes their own mountain" out of the van to view another prairie dog colony in an especially windblown location (H. Hinam, photo). 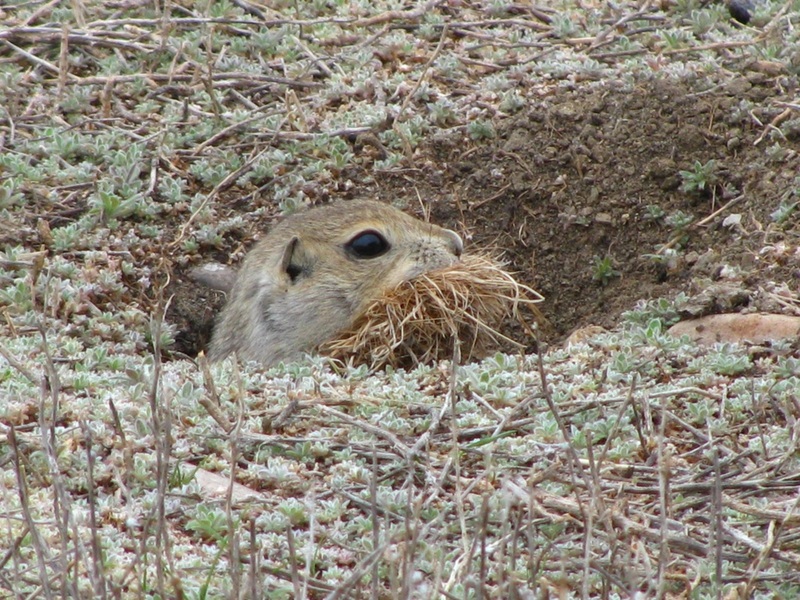 A prairie dog - the quintessential animal of Grasslands National Park and our main research subject for the first week of the course. 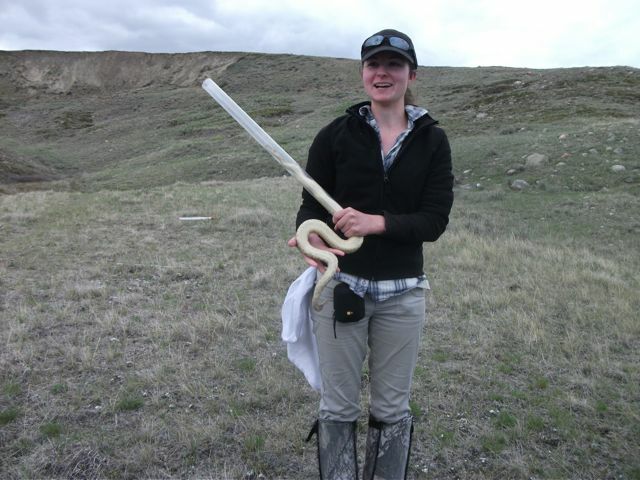 A research student from University of Regina shows and tells us about the snakes living in southwest Saskatchewan! 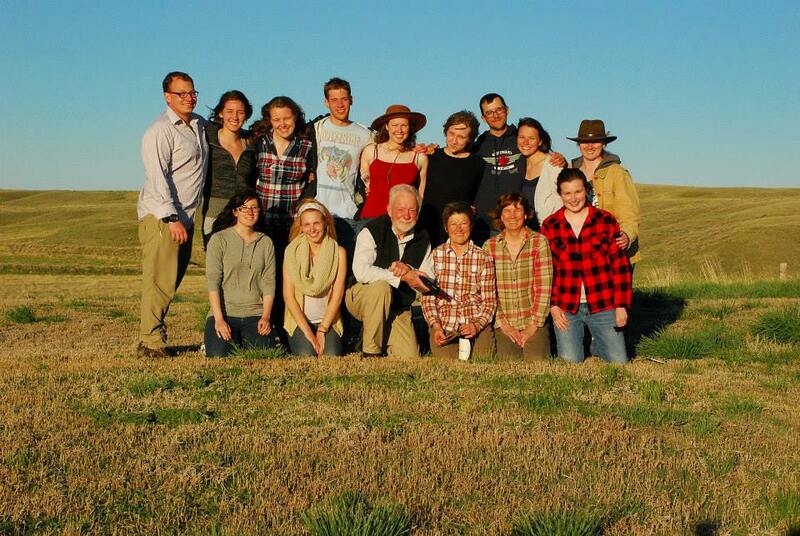 Last evening at The Crossing with our hosts, Johanna and Ken Jensen, in the front row. 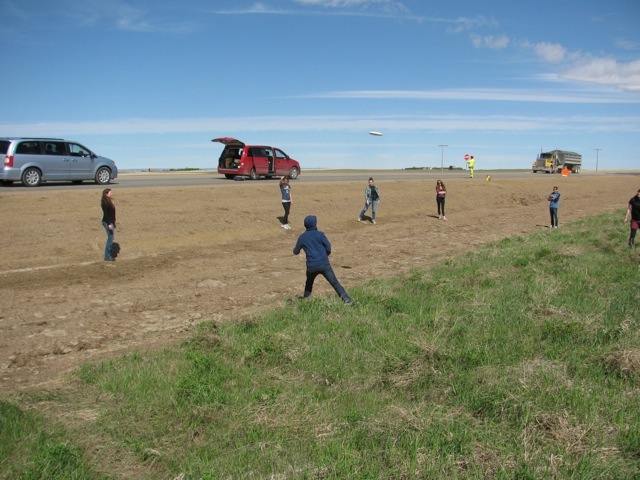 Students get some frisbee time during a construction stop as we travel from Grasslands National Park to the McIntyre Ranch. See www.wesolson.ca to learn about the work and art of Wes Olson and Johane Janelle. 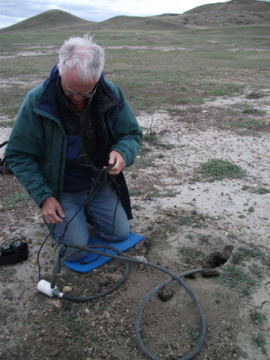 This includes ecological consulting services, writing and artwork. Each of the groups you have introduced me to over the past several years had 100% engagement in the topics being discussed, . . . these people all want to be where they are, and they clearly want to gain as much from your course as possible. The questions are always pertinent, probing and demonstrate a level of knowledge and comprehension I don't often encounter. 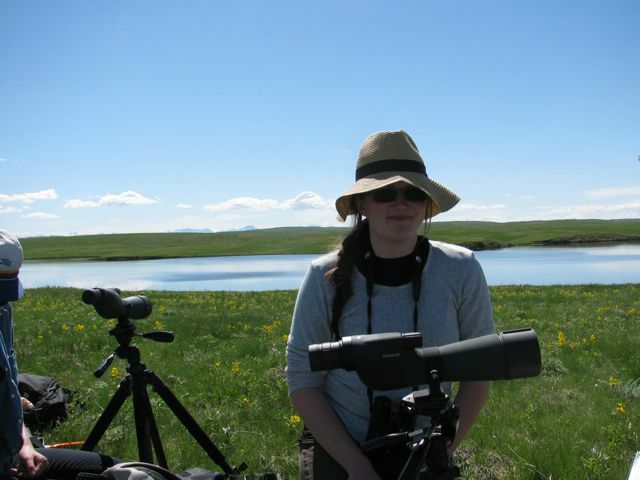 My intent when I meet with a group is to try to provide them with a basic level of knowledge relevant to the topic, to perhaps give them a deeper appreciation and understanding of the complexities and beauty of the ecosystem we are in at the time and if I'm fortunate, to make them think. This has been easy with your groups and each year I look forward to meeting the next group. I wish the opportunity to join a class like yours had been provided to me when I was their age. 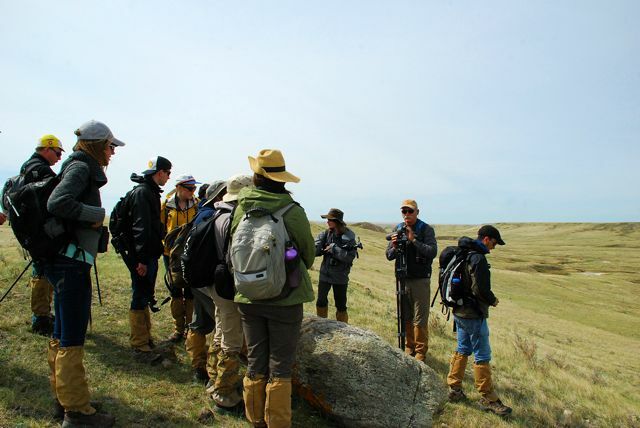 A new and significant addition to the course in 2013 was having Blair First Rider and Kathleen Jackson introduce the class to traditional ecological knowledge and perspectives of First Nations people living in the region (photos, H. Hinam). 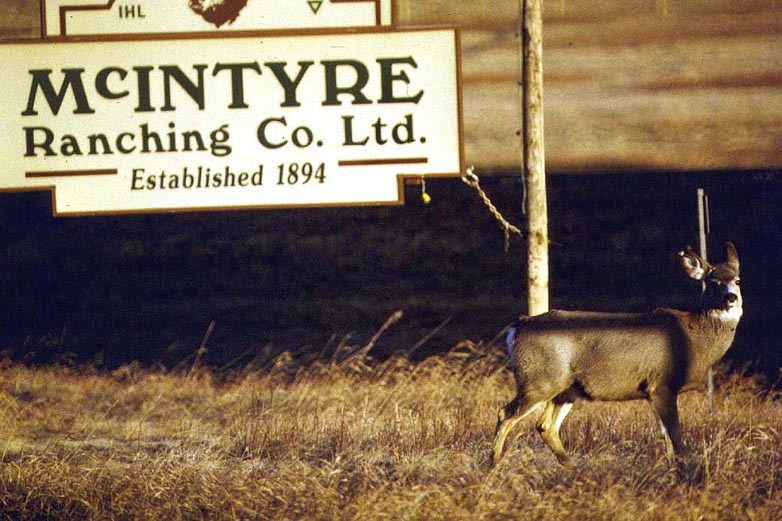 It is not unusual for deer to greet us when we arrive at the McIntyre Ranch. 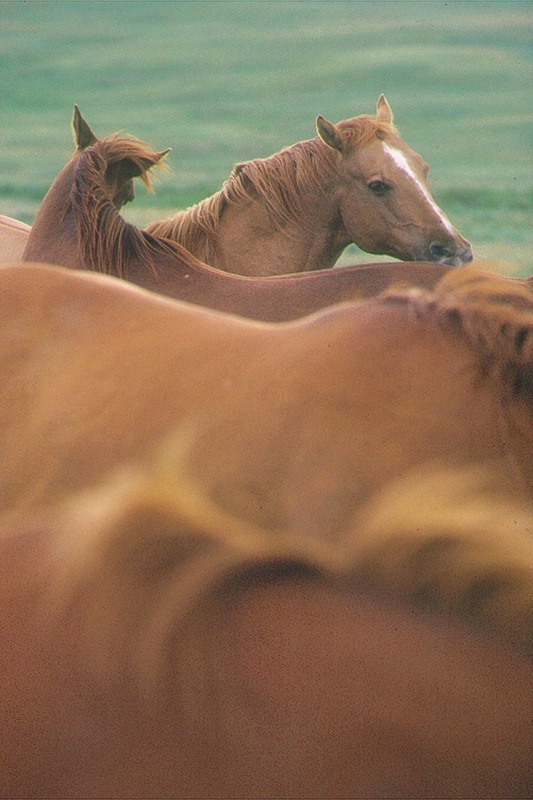 The building at Meadows Camp is our home base during the McIntyre Ranch portion of the course. 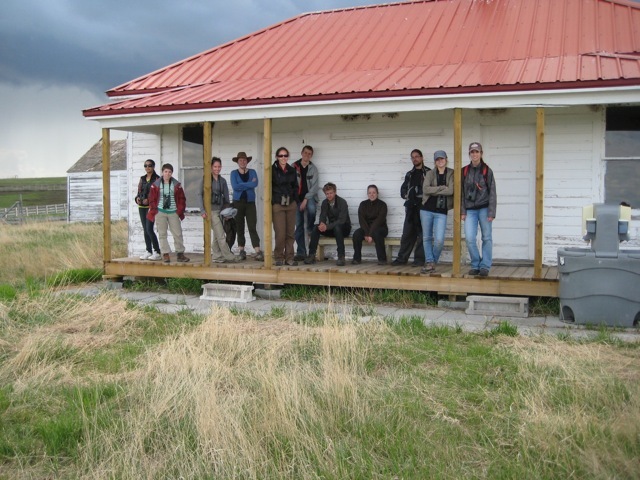 In 2011, the rain and cold was so extreme (20-40 ml daily) that students stayed in housing at the ranch headquarters. 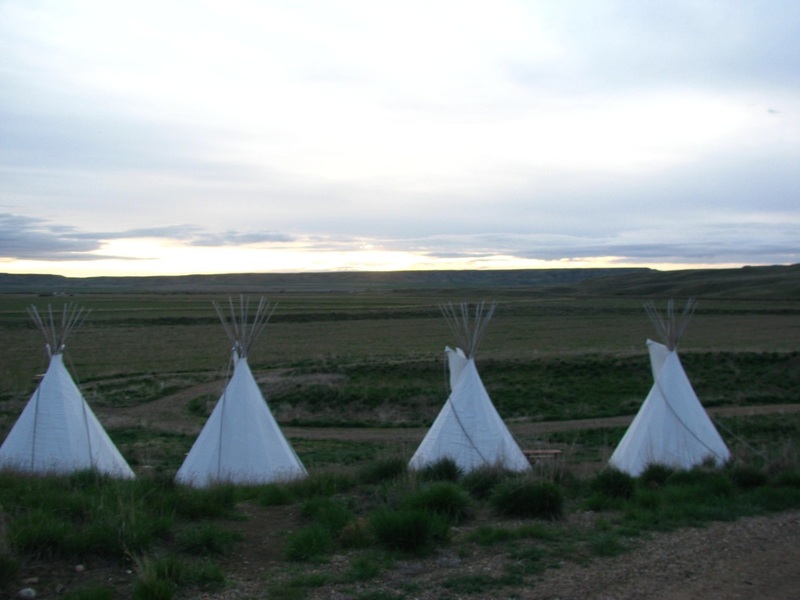 We want to raise funds to construct a bunkhouse at Meadows to ensure future groups can stay at Meadows. 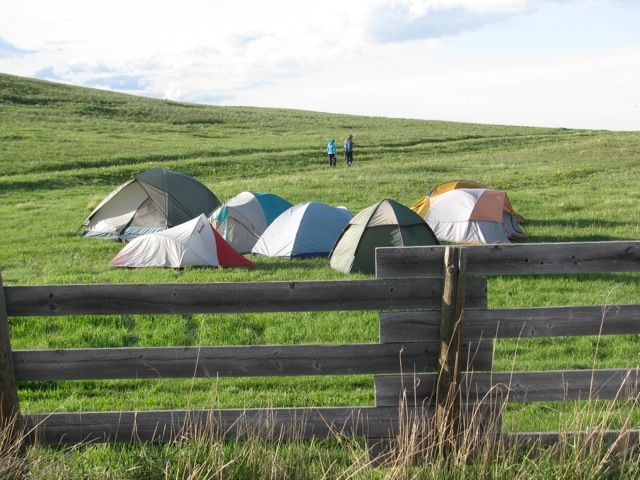 The main building and tents at Meadows Camp (above two photos). 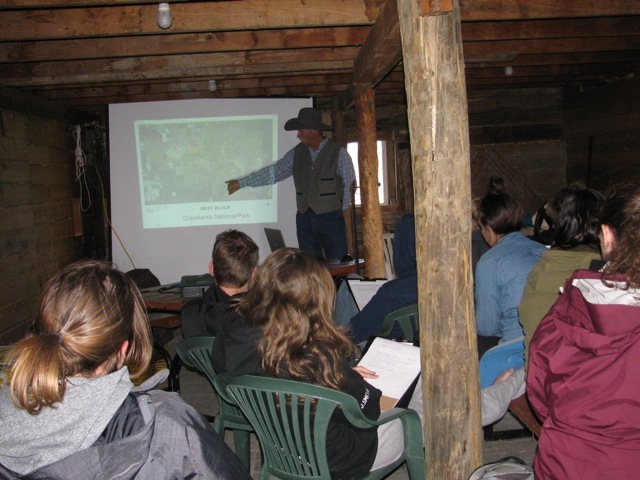 The ranch renovated this building for use during the field course. 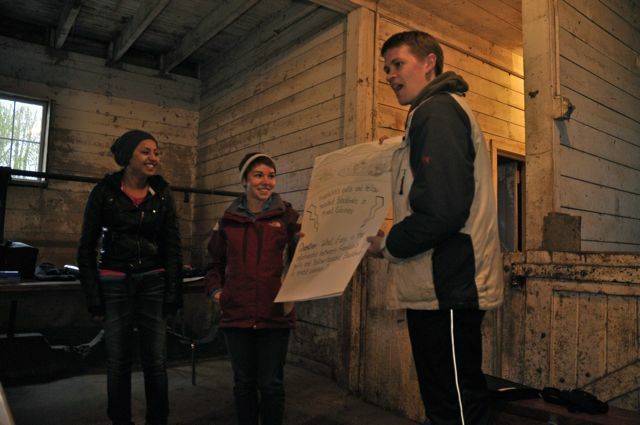 Students use the building to work late at night (below) and for meals in poor weather. 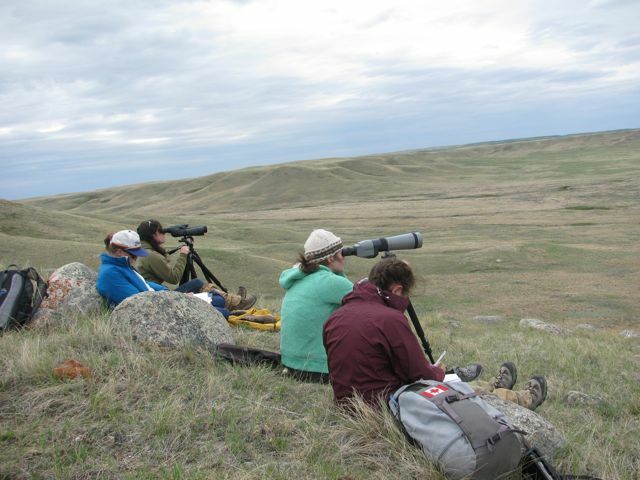 Above: Dr. Gail Michener, University of Lethbridge, spends the afternoon at Meadows Camp talking with the students about Richardson's ground squirrels. 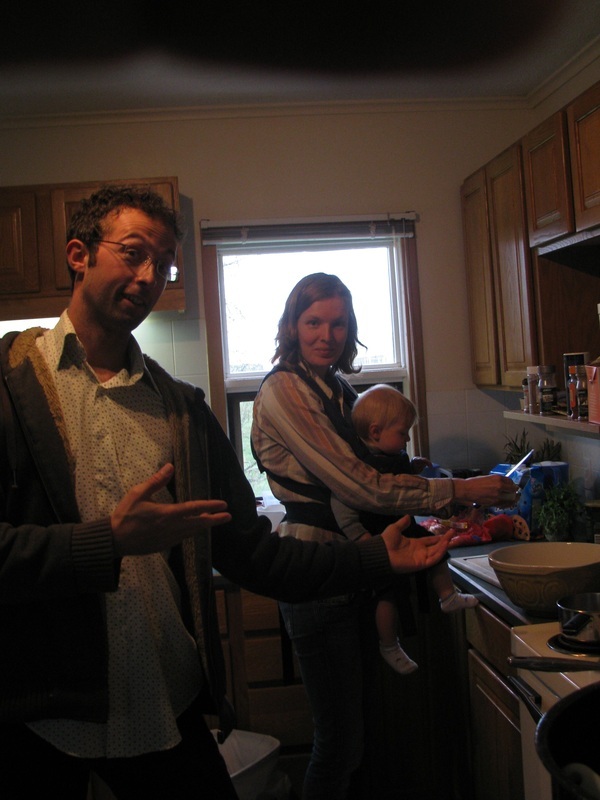 Rineke (at right with baby Jens and friend and sous Chef Bas at left) has come to the ranch to provide wonderful meals as a volunteer cook three times now! Thank you Rineke!!! 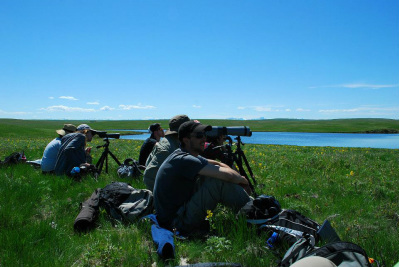 Some students became hooked on birds when observing the behaviour of northern shovelers during a waterfowl study. 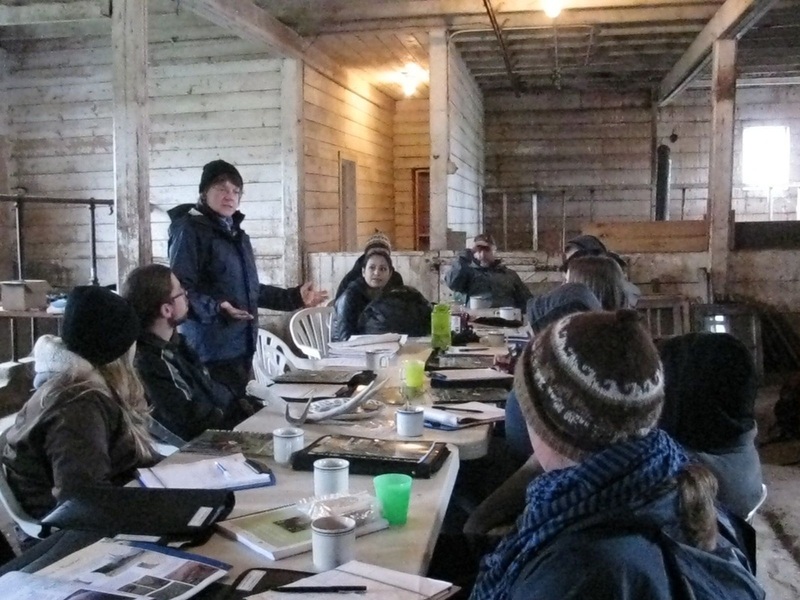 Cheryl Bradley (above standing) and Lorne Fitch talk about the challenges involved in prairie conservation. 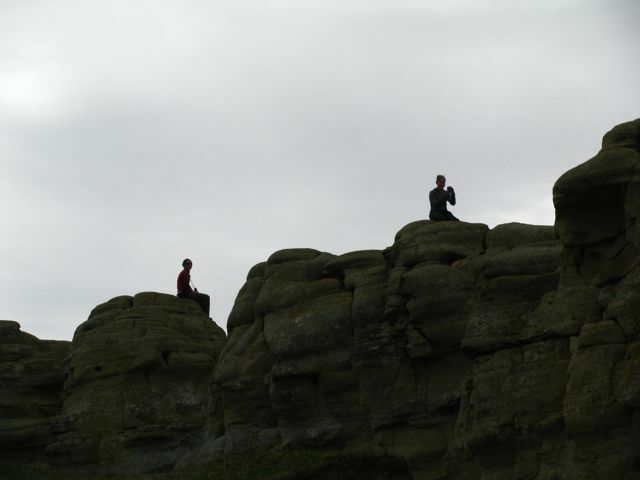 Students climb the hoodoos! Fun and a great view! 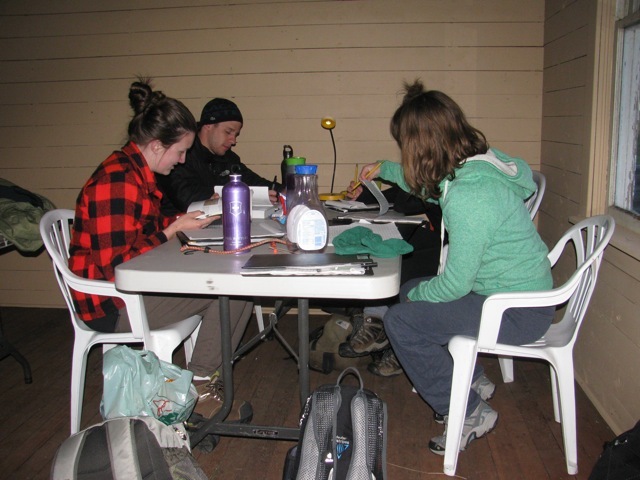 Students work on their projects at Meadows Camp late at night. 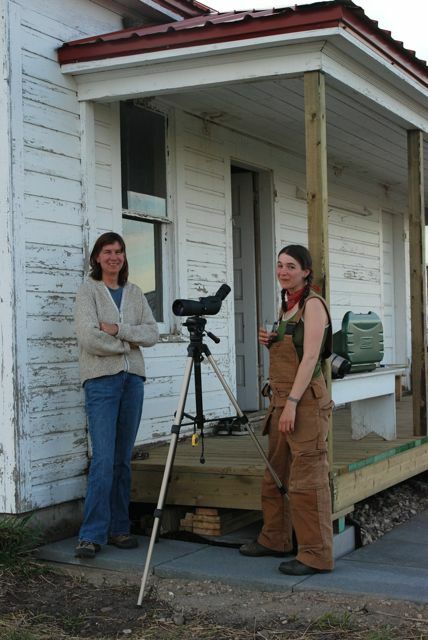 Student Leanne (above right) views a nest of ferruginous hawks from the deck at Meadows Camp. 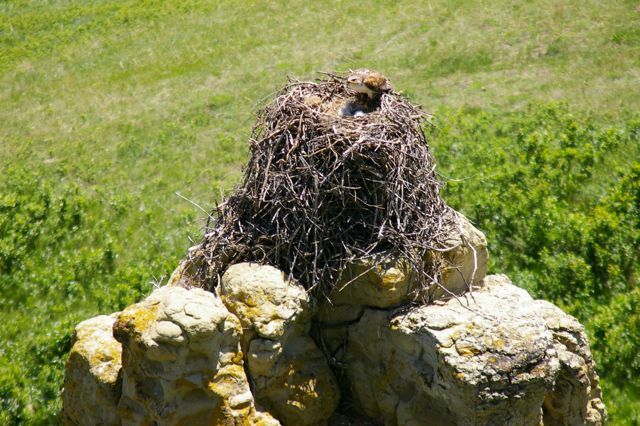 Below, a female hawk shades her chicks at a different nest. Students present their projects the last night of the course in 2009. The absence of electricity and powerpoint challenges them to be creative. 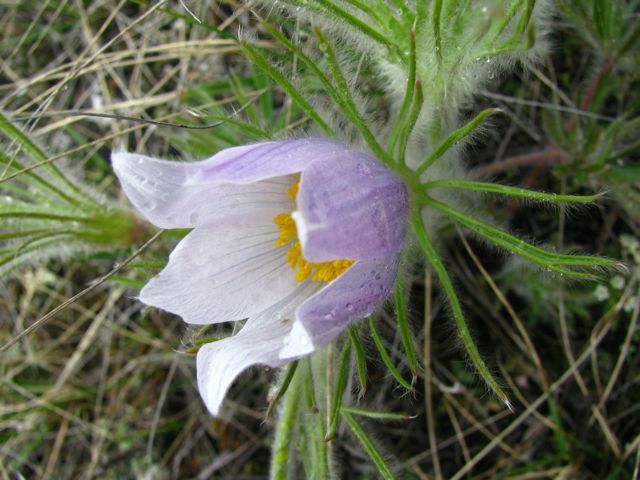 Weather is variable in southern Alberta in May. 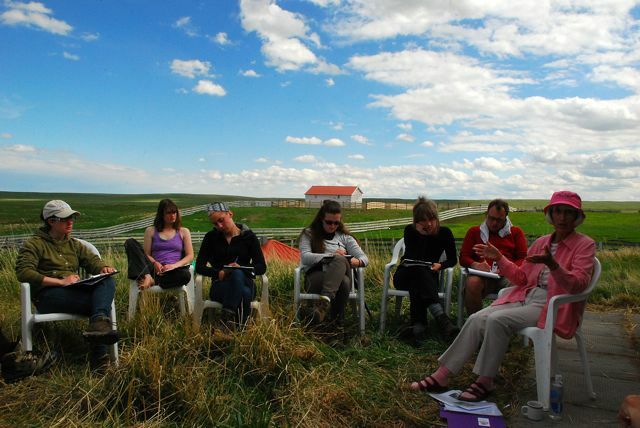 Students in 2011 faced cold temperatures and 20-30 mm rain daily. They still had fun telling the rest of us about their findings. 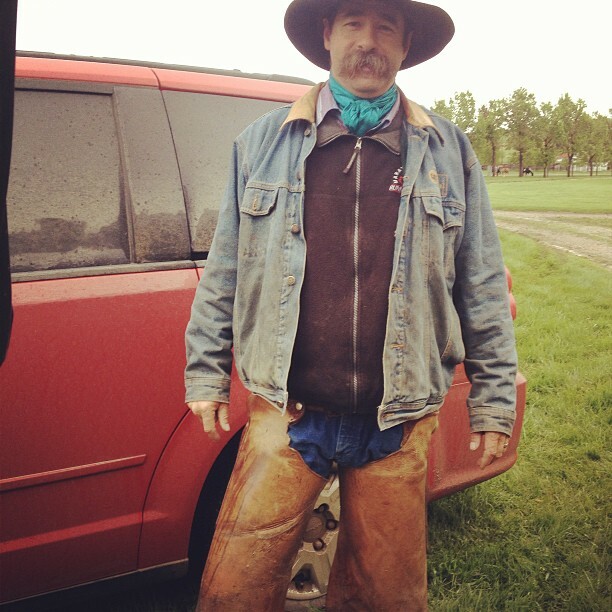 Neighbour Kurt, a cowboy at the ranch. 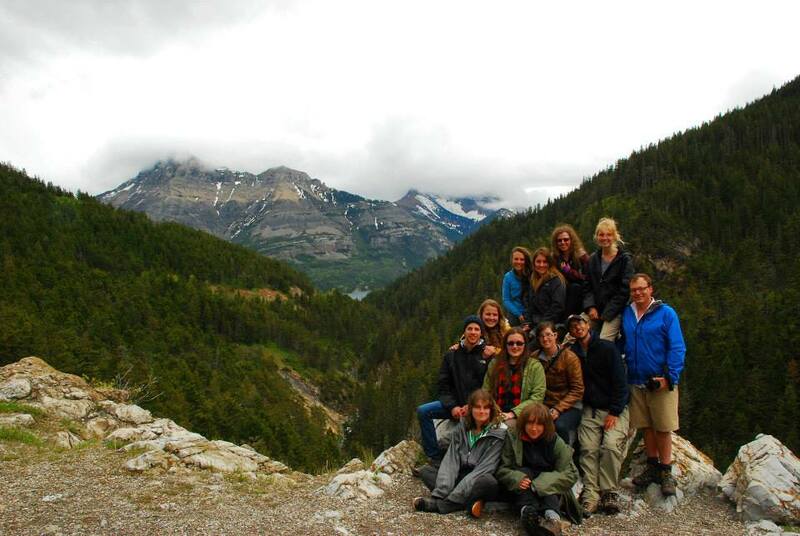 Students get some R & R at Waterton Lakes National Park on their last day (H. Hinam).